How Are Dog Bites Like Tetris? I admit, friends, that I am secretly a video game addict. I don’t get to play often, but I’ve been known to spend far more hours than I should absorbed in a great game. One of the first games I fell in love with was Tetris (surprising since I’m usually a quest game devotee). I assume that most of you know about Tetris, but to clarify, it’s basically a timed jigsaw puzzle. Pieces fall from the top of the screen and players must manipulate these pieces to create solid lines. When you clear a line, you gain points and the line disappears, leaving more screen room for new lines. As you progress throughout the game, the pieces are dispensed more rapidly. They start to build up, leaving you with less room and less time to manipulate each piece. Eventually, the pieces stack so high the screen is filled and no more lines can be created. That’s how you lose Tetris. All dogs, whether they are defined by owners or behavior professionals as “reactive,” “aggressive,” and yes, even “friendly” can and will bite. A service dog or therapy dog can and will bite. The goofiest dog you’ve ever seen can and will bite. The dog that allows young children to climb all over him and pull his ears or tail with seeming aplomb can and will bite. Bites are usually caused by an accumulation of stressors. Each time a dog is exposed to a stressor, stress hormones are dumped into the brain. These stress hormones are like the puzzle pieces in Tetris. They build up over time. 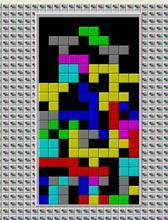 You have to actively reduce the stress (like a Tetris player clearing lines) through management, desensitization, counter conditioning, and general stress reduction techniques. If you are not taking steps to reduce the stress, it begins to accumulate. The dumping of stress hormones into the brain leaves the dog increasingly sensitized to stressors, which replicates the puzzle pieces dropping faster and faster until you eventually reach the threshold. Soon, the dog bites. The game is over. Stressors vary in individual dogs. One dog may be stressed by loud noises, nail trimming, men with beards, wearing a shock collar, foul weather, and a bad diet. Another dog may not seemingly respond to these factors but is sensitive to visits to the vet’s office, small children, cats, people that smell like beer, dogs walking past the fenced in yard, and people approaching or entering the home. Every dog has stressors (commonly called “triggers”) and a big part of effective behavioral modification strategies is identifying these as accurately and thoroughly as possible, which allows behavior consultants and handlers to focus their efforts most efficiently. Stressors, like Tetris pieces, accumulate over time. Bite thresholds also vary. Admittedly, you have to “push” some dogs a lot more than others to elicit a bite. Some very fearful, stressed, or aggressive dogs may require very little provocation before biting. Other dogs tolerate unbelievable amounts of stress before resorting to using their teeth to defend themselves. Working with the latter group of dogs is like playing the first level of Tetris. The pieces move slowly. It’s relatively easy to clear lines quickly enough to prevent a bite. Working with the former group of dogs, those who have a low bite threshold, is like playing Tetris at level 57. Because the dog is so easily stressed, it’s also like starting with your screen 3/4 full. When working with the latter group of dogs, if the screen is never really cleared and the stress hormones are not reduced, eventually the dog’s threshold lowers even further. You’re playing with a smaller screen, and now it’s even easier to lose. Whenever I talk to a client about a biting dog, we first work together at establishing the triggers. What things would make this dog more likely to bite? Then we talk about the previous week of the dog’s life – what did the dog do? After six years of inappropriate diet, the dog was malnourished and yet very overweight. For his entire life, he’s subsisted on the canine equivalent of a diet comprised of Mountain Dew, potato chips, cheesecake, fast food, Snickers bars, and pixie sticks. For the last few weeks, the owner has had construction crews at her house. The project is a big renovation. Two of the guys on the crew have beards, and the project makes lots of noise. Constant sounds of power tools and construction assault the ears of both human and canine residents for eight hours a day. This project has kept the owner quite busy, so she hasn’t really had a lot of time to provide the dog with exercise, training, or his regular play dates. Sunday it started raining. Since then it has poured continuously. Monday night was the worst thunderstorm in fifty years, the dog couldn’t sleep. The thunder continued well into the morning. The dog was terrified to go outside, but needed a potty break. The owner put the shock collar on and released the dog into the yard, “contained” by an electric fence. At this time, the bearded mailman approaches the house. The dog rushes the fence line to bark at the mailman. He receives an electric shock. He bites the mailman. The puzzle pieces have filled the screen, the game is over. This dog is very likely, as the owner said, a “friendly” dog and is not technically “aggressive.” He doesn’t need to be euthanized, he needs stress reduction, training, and management. He needs an owner that is knowledgeable about body language. He needs a human guide who is empathetic and understanding, who does not put him in situations he isn’t capable of handling comfortably. It is not any single puzzle piece that loses the game in Tetris, it is all of the puzzle pieces. It is often not a single trigger, but an accumulation of triggers in a designated time period without stress relief which cause the bite event. Dogs don’t “bite without warning,” they bite when all their warning signals go unheeded. If you are concerned about your dog’s biting, a qualified behavior professional will help you identify the warning signs and turn them into action plans. With new strategies, you can set your dog up to never lose the biting game again.